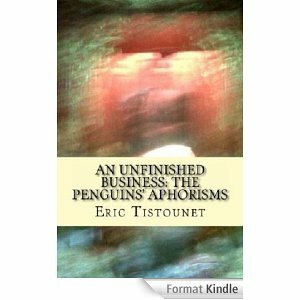 Back in June 2012, Penguins’ Aphorisms and related stories and photos came to life on the author’s computer. Thereafter, for several days that eventually became weeks and months, the Penguins irrupted in an awkward and impromptu manner in his life. The aphorisms and other related texts are accompanied by illustrations. They have been reproduced in this book as is, but the author never found any clear and logically link between the written materials and the images. This being said, the combination of aphorisms and photos represents an opening in a whole new world far away from us, from the financial crisis and from the climate change or any other world crisis… In this way, they do constitute a glimpse into a world that will never be or that may exist in a parallel universe. Diving into the Penguins’ wisdom as illustrated by seemingly unrelated pictures is an invitation to dream … and think … and fly away from reality.